With fall now in full swing, it’s time to get outside and enjoy the rich colourful hues and crisp autumn breezes. But did you know being outside can actually make you happier? According to several scientific studies, embracing nature can increase your overall happiness and improve your mental health. Studies have found that nature makes us feel more alive and energized, which in turn boosts our mood. For me nature is the ultimate therapy. It helps me to walk away from my stresses and gain some much needed perspective. All of my nagging thoughts seem less significant when I’m taking in the beautiful scenery just outside my door. It seems pretty straightforward, but all too often we get bogged down by life’s responsibilities and we forget to stop and enjoy the view. For instance, take my coworker who I met with just the other day. 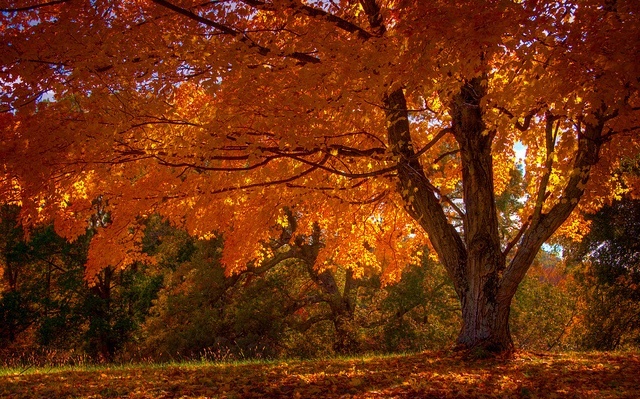 His office looks out onto a clearing flanked by trees ablaze with red, yellow and orange leaves. It was so breathtaking I just had to say something. But he hadn’t even noticed. He was so distracted by his nasty cold and a desk full of assignments that he hadn’t even taken a moment to look outside. While we might not be as fortunate to have that kind of view from our window, there are lots of other ways to get outside and enjoy the sights, sounds and smells of nature. Go for a walk – Take a stroll in your neighbourhood park. Or if you’re feeling ambitious, get your blood pumping on a nature hike. Go for a ride – With winter just around the corner, head out for one last ride on your bike or rollerblades before the snow hits. Plan a pick-up game – Enjoying nature need not be a solitary venture! Grab some friends and start a pick-up game of football or soccer. Get creative – Let nature be your muse and snap scenic shots with your camera or collect vibrant fall leaves for some DIY crafting. My challenge to you this week is to unplug from your T.V., smartphone or computer and get outside and enjoy the beautiful scenery. Give it a try for as little as 20 minutes and see how you feel. How do you spend time outdoors? Share your thoughts! So now that we know that expressing gratitude directly relates to our overall happiness, how do we put it into practice? One of my favourite strategies comes from Canadian writer Neil Pasricha whose 1000 Awesome Things blog helps to inspire millions of followers to embrace the little joys in life. Pasricha’s concept is pretty simple: everyday he posts about something awesome counting down from 1000. Entries range from #995: finding money you didn’t even know you lost, to #858: the other side of the pillow, to #67: when cats do stupid things. His blog is such a success that he’s gone on to publish several bestselling books. Pasricha’s awesome list resonates with people because it helps us to appreciate the little things in life that we too often take for granted. While each entry might seem insignificant by itself, together the list starts to paint a picture of how awesome life truly is. The best part of Pasricha’s list is that it’s an easy way to practise gratitude. Write down one or two awesome things everyday for a week. At the end of the week, read them over and see how you feel. Try the SoulPancake experiment for yourself. Start by thinking of someone really influential in your life. Next, write down reasons why they’re so important to you. Finally, call that person and read what you wrote about them and see if you notice a jump in your happiness. What’s on your awesome list? How do you practise gratitude? Share your thoughts!